The peanut butter you remember from childhood now has competition from creamy spreads that are ground from a variety of nuts, seeds and other legumes. The peanut butter you remember from childhood is seeing some stiff competition these days from creamy spreads that are ground from a variety of nuts, seeds and other legumes. These spreads can add variety to your healthy diet. And they aren’t just for sandwiches; they’re great on fruits and vegetables too. But not all these spreads are equal, nutritionally speaking. Some of these offer great nutrition, while others are nutritionally bereft, heavily processed or loaded with sugar, bad fats and calories. We talked to Lindsay Malone, MS, RD, LD, about the many varieties of nut, seed and legume spreads you now see at the grocery store to find out which are worth trying and which ones you should avoid. Here’s what she had to say. Almond butter is a great choice if you’re looking to broaden your taste horizons past peanut butter. Almond butter tastes great and is similar in texture and thickness to peanut butter. 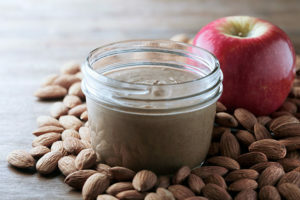 The good news nutritionally is that almond butter has about 3 grams more of heart-healthy monounsaturated fat per serving than peanut butter. Plus, unlike processed regular peanut butter, almond butter usually is lower in sugar and has no hydrogenated oil, meaning no unhealthy trans fat. Look for brands with a single ingredient: roasted almonds. While cashew butter is somewhat lower in fat and protein than peanut butter, it can be a little higher in sugar if sugar is an added ingredient. As with all nut butters, look for varieties with only nuts as the ingredients — that means no added oils, salt or sugar. Cashew butter can be a healthy option, especially if you’re avoiding legumes like peanuts or soybeans. Be mindful of your portion size, since nuts like cashews are high in fat and calories. Because of its high fat content and relatively low amount of protein, coconut butter is not a nutritional standout on our list. And, despite the recent craze for coconut oil or butter, there is only limited research on any special health benefits. Coconut butter is best viewed as an occasional indulgence, such as an ingredient in desserts or snacks. Fun fact: While the Food and Drug Administration classifies coconut as a tree nut, a coconut is not a true nut. Botanically speaking, a coconut is a drupe, a fruit in which an outer fleshy part surrounds a pit of hardened endocarp with a seed inside. Traditional, full-fat, shelf-stable peanut butter like the kind you (and everyone else) ate as a kid is higher in sugar than other nut butters and full of hydrogenated oil. Food manufacturers add this man-made fat during processing to give peanut butter a creamy texture and to keep the oil from separating. Hydrogenated fat is a hidden source of trans fats, which increases your risk for many chronic diseases, such as heart disease, stroke and type 2 diabetes. Trans fat is so unhealthy that the Food and Drug Administration recently announced it will require manufacturers to phase out trans fats from processed foods over the next three years. While almond butter, tahini and natural peanut butter may be good additions to your daily diet, take care with this trendy spread. While delicious, hazelnut spreads can contain a good deal of sugar — some of the most popular add chocolate flavoring too. Be sure to read the nutrition label for sugar and fat content, and watch out for hydrogenated oils as well. Hazelnut spreads should be treated like rich, calorie-laden desserts — eat them sparingly. If you want a peanut spread, this is the best choice: Pure peanut butter – with nothing else but peanuts (or perhaps salt) on the label’s ingredients list. Avoid brands with added sugars, fats, salt, preservatives and chocolate. Don’t bother with low-fat peanut butter. The calories are the same or higher, thanks to the extra ingredients — usually sugar — that manufacturers add to improve the taste after taking out the fat. Natural peanut butter brands have about half as much sugar as traditional peanut butter — and the natural, healthy monosaturated fat helps you to feel satisfied and full. Soy nut butter can be a good option tor those with tree nut or peanut allergies. This spread also can be a good choice for your kids’ lunch if their school or lunchroom is peanut-free. Made with lightly roasted soy nuts, soy nut butter is quite similar to peanut butter in taste and texture but has significantly less total and saturated fat. Soy nut butter offers 7 grams of soy protein per serving. RELATED: Does Soy Boost Your Breast Cancer Risk? Sunflower seeds can be processed into a smooth, spreadable alternative to peanut butter — another great nutrition choice for anyone with a tree nut allergy. Sunflower seeds are a good source of protein, fiber, zinc and iron, and are low in saturated fat. Sunflower butter contains almost four times as much vitamin E as peanut butter, and about twice as much iron, magnesium, phosphorus and zinc. Sunflower butter also has a bit more sugar and fat than peanut butter. Tahini is a thin paste made from ground sesame seeds and is a staple ingredient in Middle Eastern cooking. Tahini is used in dishes such as hummus and baba ganoush, or thinned with water to make a creamy sauce to top sandwiches and salads or serve as a vegetable dip. Tahini is a good choice nutritionally because it typically has no added ingredients such as sugars. Sesame seeds are an excellent source of copper and a very good source of manganese, and a good source of calcium, magnesium, iron, phosphorus, vitamin B1, zinc, molybdenum, selenium, and dietary fiber. A note of caution, however: research suggests that allergies to sesame seeds and tahini may overlap with peanut allergies. Walnuts are a great choice for a butter because they are a highly valuable source of the omega-3 fatty acids that are essential for health. Walnut butter is slightly lower in protein and slightly higher in fat than other nut butters, but its omega-3s make it a winner. You might not be able to find walnut butter at your local grocery store, but try your local health food store or online. Or make your own walnut butter at home using a blender or food processor.